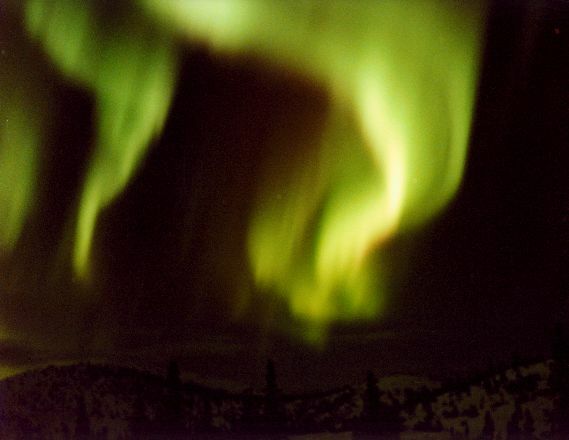 In March 2003, I took a trip to Alaska so I could see the aurora borealis. I had always wanted to see an aurora up close. We stayed at the Chena Hot Springs Resort, located over 60 miles north of Fairbanks. The skies were dark, and the aurora was active. It was a great sight to see. Auroras are one of the most awesome and eerie natural phenomena on Earth. The aurora appeared as glowing greenish curtains with red or pink fringes. The curtains changed rapidly, waving as they gradually moved across the sky from west to east. The aurora is caused by high-energy particles from the Sun. The solar particles are charged, and consequently are deflected by Earth's geomagnetic field. Under most circumstances, the charged particles will hit the upper atmosphere near the magnetic poles. During a solar storm, the aurora can sometimes be observed at lower latitudes. The charged particles cause oxygen and nitrogen atoms in the upper atmosphere to glow, thus producing the beautifiul displays that we observe as the northern lights. This shot was taken with a Mamiya 645AF camera and an 80mm lens using Fuji 800 speed 120 film. March 1, 2003 at 0800 U.T. Description of equipment used to acquire images.